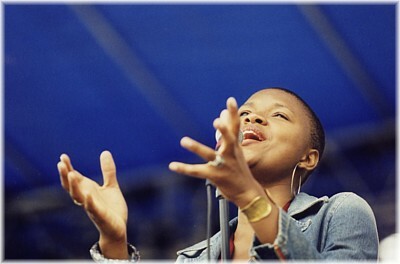 Extraordinary vocalist Lizz Wright will be making her Bay Area debut on January 20 & 21 @ Yoshi’s for two shows each night. If you have not had a chance to see her live, you do not want to miss these shows. Tickets for the 8pm shows are $14 and $10 for the 10pm shows. You really can’t beat these prices so let’s give her a great big Bay Area welcome and sell out all the shows. I will be at the 10pm shows each night. Hey New York City!! You can see Lizz at the Blue Note, January 6-11. This entry was posted on Tuesday, January 6th, 2004 at 8:05 am. It is filed under Lizz Wright. You can follow any responses to this entry through the RSS 2.0 feed. NICE!!! I can not think of a better venue for her to make her Bay Area debut. Can’t wait for you to recap the experience for us (including what you had to eat if you do so) LOL! I’ve been waiting for her to come even close to Atlanta. ooh, aah! I’m leaving the area on the 19th. DAMN! i LOVE lizz wright! i would almost go to NYC this weekend, but i got other plans… ah well! uhhh… if only i could be there! Save a seat for me, J!